This weekend, I watched the new movie, Selma. Oprah Winfrey, a notoriously close-minded liberal with a willingness to throw the race card almost as much as the likes of Al Sharpton, was heavily involved in making this movie, so I was a little concerned about what I was going to see. Surprisingly though, Selma is much more accurate than I ever expected. The historical inaccuracies are relatively minor and most are easily overlooked. I was disappointed that there was no mention of A.D. King, Dr. King’s younger brother (and father of Dr. Alveda King), who was also present in Selma. I was a little disappointed, but not terribly surprised. After all, I’d be willing to bet good money that there wasn’t a single conservative involved in the creation of this movie. Just the subject matter alone is enough to raise some very uncomfortable issues for Democrats when dealing with racial issues in America in a factual way. After all. It’s pretty hard to avoid the fact that the racist politicians and lawmen who obstructed, intimidated, brutalized and even murdered those who were demanding the liberties we are all endowed with, were all, without a single exception, Democrats: Bull Conner, Wilson Baker, George Wallace and even J. Edgar Hoover. Including the father of one of today’s influential and passionate black women, a Christian minister, pro-life activist and, yes, conservative Republican, probably hit a little too close to home for them. There were only actually two things about this movie I wanted to address. Speaking of shortcomings in our education system, one of the first things I heard about Selma that piqued my interest, was from some very offended liberals. Beside the fact that liberals have a default setting of being offended most of the time, this caught my attention because they were upset at how ‘historically inaccurate’ the movie is because it portrays President Lyndon Johnson as a…gasp…racist! To be clear, Johnson was absolutely a racist. Yes, he did support and sign the Civil Rights Act of 1957 (the bill he referred to as “the n*gg*r bill”), but only after dragging his feet and opposing it. In 1948, then Senator Johnson said, regarding the civil rights efforts during the Truman administration that it, “is a farce and a sham–an effort to set up a police state in the guise of liberty. I am opposed to that program. I have voted against the so-called poll tax repeal bill … I have voted against the so-called anti-lynching bill.” I assume that, for a man like Johnson, it was very important to protect the practices of poll taxes and lynchings. He fought against Eisenhower’s 1957 civil rights bill, ultimately using his position and power in the Senate to gut the bill of all its enforcement powers. He also fought against the 1960 Civil Rights Act. Johnson kept company with many like-minded racists in the Democrat Party but, unlike most of them, he came to understand the potential political power of a voting black populace and decided to attempt to rewrite his own history to make it look like he was the type of man who embraced what he’d actually been fighting against his whole life. A line from the PBS special, LBJ, says, “But the real measure of a leader is what he gets done, the size of the problems he faces. Before Lyndon Johnson, we were essentially a segregated society.” The thing is, if Johnson had his way, we would still be segregated today. It’s true that you measure a leader by what he gets done, but make no mistake. Johnson was not the leader to ‘get done’ anything to further the cause of Civil Rights in America; he was simply dragged along against his will in the wake of the real leaders of the time; people like Martin Luther King, Jr., A.D. King, John Lewis, Hosea Williams, James Orange, Roy Innis, A. Phillip Randolph, and Bayard Rustin, among so many others. These were the people who effected positive change in spite of the opposition of men like Lyndon Johnson. It’s sad that so many have since been conned into mistaking Johnson’s political expediency for any sort of change of heart or, even worse, have just blindly bought into the narrative of the man as some kind of Civil Rights hero because the media and other voices on the left say it’s so. The second thing that struck me came straight from the movie itself. While I wasn’t particularly surprised, it was disturbing to hear the words ‘progressive’ (used once) and ‘liberal’ (used twice) to describe the people who were inclined to support the Civil Rights Movement and the efforts of Dr. King. While it is true that the progressive movement wasn’t terribly advanced or high profile yet and the term ‘liberal’ was only beginning to be taken and twisted by the left, it’s clear what the subtle message that the movie makers are trying to get across is: that it was those evil Republicans who wanted to keep the black man down and the ones who could be rallied to stand against that racism were the Democrats. Of course, they had to make this message subtle for the simple reason that it’s an outright lie. Every single name mentioned in Selma as an enemy of equality was a devoted Democrat. 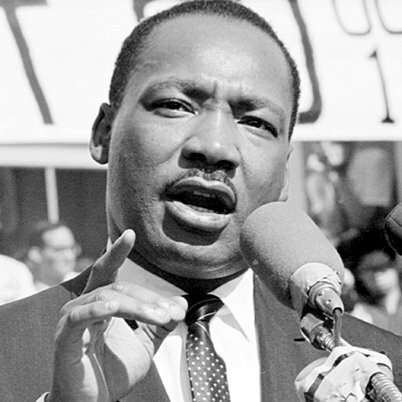 It was the religious leaders that Dr. King called on for support, the majority of whom, at least those who were affiliated, were Republicans and definitely conservative, much like Dr. King himself. It was Republicans, both black and white, who were standing beside these activists across the nation, often losing their lives in the process, too. It was the NRA that was created specifically in order to arm and train black Americans so that they had a chance of defending themselves against those who immersed themselves in racial hatred, especially in the form of the Democrat sponsored, funded and manned Ku Klux Klan. And, yes, I’m already hearing this nonsense starting to resurface about how there was this great party switch and the Republicans of then are now the Democrats of today. That’s always been a lie and always will be. To this day, the only example anyone can point to of a Democrat of that time becoming a Republican is Strom Thurmond. The thing is, Thurmond had a major change of heart and deed and turned his back on his racist practices and words. Of course he had to leave the Democrat Party. To do otherwise would’ve been like someone turning vegan but staying a member of the steak of the month club. (I assume something like that exists because, if it doesn’t, then it really, really should!) Here’s just a handful of Democrats (this article would be HUGE if I put all of them in) who were opposed to civil rights and equality for blacks who never made a single move to leave the Democrat Party: Orval Fabus, Bull Conner, Benjamin Travis Laney, John Stennis, James Eastland, Allen Ellender, Russell Long, John Sparkman, John McClellan, Richard Russell, Herman Talmadge, George Wallace, Lester Maddox, John Rarick, Robert Byrd (Bill Clinton’s good friend) and Al Gore, Sr. (his son invented the Internet). The truth is, the place where those who wallow in racism or victimization or a desire to imprison people, be it in chains of iron or the more deceptive chains of entitlement and dependency, feel the most comfortable is the Democrat Party. That has never changed from Day One. The only things that have changed are the words they subvert to describe themselves and the increasing sophistication of the shell game they play to fool so many people. Believe it or not, in spite of the time I took addressing these two factors, they’re actually pretty minimal problems in regard to this movie. Selma is a movie I’d really encourage people to see. I really like the way it portrays Martin Luther King Jr.; as a man who is, like the rest of us, flawed and at times unsure, but who follows his conscience and commits himself to promoting what is right and standing against what is wrong. He sets a standard in those ways that is worthy of emulation and it is an example that so many members of the modern Republican Party would do well to take to heart before we completely lose our way. I found myself crying at the sight of people’s capacity for cruelty towards others and my heart swelled with pride at those who answered the call to oppose such overwhelming hatred and violence. While I’m used to the sort of biased tripe that Oprah Winfrey and other Hollywood liberals put out, like that train wreck of a movie (but not the book), The Butler, I do have to give credit where credit is due. Other than a couple of minor attempts to alter the political reality of our history, this movie is very well done and worth the time to watch. Next time, I’ll be talking about how the new Dumb and Dumber movie is a direct parallel to the Democrat National Convention. Well, probably not, but you never know! Posted in Civil Rights, Politics, Racism. 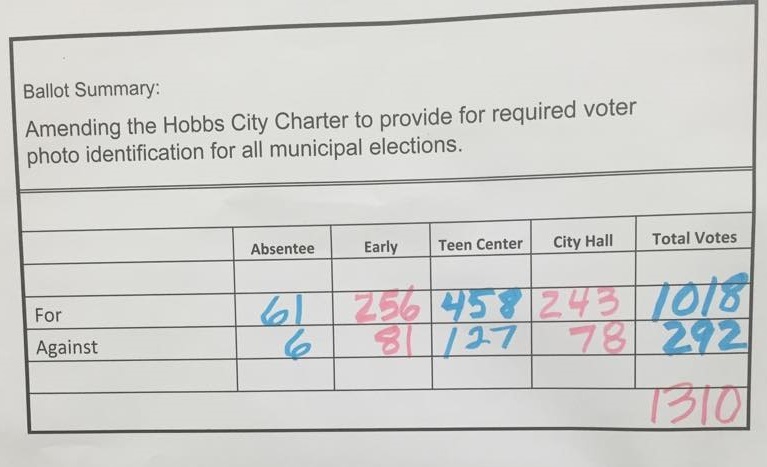 Voters in Hobbs New Mexico today voted to approve a measure that would require identification to be presented in order to vote in municipal elections. The vote was decisive with 78% of voters in favor of the measure in spite of efforts by opposition, including the NAACP. B.J. Choice Sr., a member of the NAACP and Hobbs resident, said, “It’s an effort, in my opinion, to suppress people coming to the polls.” He said the legislation is like “the poll tax and the literacy test that minorities and poor whites had to go through.” Opponents, including Choice, have also compared it to the Jim Crow laws and say that groups like African Americans, Latinos and the elderly will have a harder time obtaining photo IDs in order to vote. Just for the record, poll taxes were instituted by Democrats to require that voters pay in order to register to vote…unless their father or grandfather had been registered previously. This specifically targeted blacks, whose fathers and grandfathers had generally been slaves with no right to vote, while whites were much more likely to qualify to have the poll tax waived. The same thing with the literacy tests; they were designed to exclude blacks, who had a much higher rate of illiteracy than whites and could be disqualified even if they were literate. As an example, in Alabama, blacks were asked to answer questions such as: name all 67 county judges in the state, name the date when Oklahoma was admitted to the Union, and how many bubbles are in a bar of soap. Jim Crow laws, also passed by southern Democrats, established the concept of “separate but equal” and severely disenfranchised and limited the civil liberties of blacks. or even get a library card. While they haven’t been vocal about these requirements for ID, Civil rights groups like the NAACP argue that voter ID laws target blacks, latinos, senior citizens and the poor by unduly restricting voting and imposing unnecessary costs. However, anyone who can prove who they are and that they are legally authorized to vote, gets to vote. The new legislation also ads that, if voters don’t have identification, the city will provide it for no charge. So, apparently, the NAACP believes that blacks, latinos, seniors and the poor are either too stupid to go down and ask for an ID, pose for a picture, or follow the same rules as everyone else or they believe that they’re too poor to afford a free ID. Or it could just be that the they’re using this issue to further promote class warfare and racial division and score political points on an issue that has nothing to do with race or class. It’s not like they have a reputation for pulling those kinds of stunts, right? Even at the state level right now, any citizen can acquire an ID by providing 1) a document of their identity (birth certificate, U.S. passport, military ID, etc. ), 2) a document proving their identification number (Social Security card), 3) two documents proving New Mexico residency (rental or mortgage agreement, utility bills, bank statement, etc.) and 4) a thumbprint and signature. It then costs $10 for four years or $18 for eight years. Citizens who are 75 or older get the ID free. That’s not what I’d call restrictive requirements. It is nothing more than establishing the identity of those the state is providing proof of and I pay more for my gym membership than either $10 or $18 a year (not to mention what I pay for my drivers license). Secretary of State Dianna Duran has called the Hobbs special election encouraging and said that she will again push state lawmakers to consider a voter ID law. If that were to happen, such legislation would very likely include making those state IDs available at no charge, as well. Hobbs is also not the first city in New Mexico to pass a voter ID law. Albuquerque and Rio Rancho also require photo ID for local elections. We currently have 34 states with laws requiring voters to show identification at the polls. The Hobbs vote is not an isolated incident and these laws are not designed to keep anyone from the polls…other than those who are attempting to perpetrate fraud on our election process. The voting rights of those who actually have the right to vote will be protected through these laws. The ones who are not registered to vote, who have had their right to vote revoked through Due Process, who try to vote under someone else’s name or who are simply not residents or even citizens? They have no right to vote anyway, nor should they, so there are no rights there to protect. Congratulations to Hobbs, New Mexico on passing a voter ID law and may the rest of us come to our senses and follow your example soon. I don’t know what happened! I stopped at the gas station on the way into work this morning and bought a soda. On the drive to work, I shook the bottle as hard as I could the whole way. When I got to work, I opened the bottle and…it exploded all over me! I just don’t understand why it would do something like that! The answer is simple as to why they’re destroying their own neighborhoods: An explosion damages everything around it. What’s amazing to me is the surprise and shock over it all and the pleas for peace, at least from those who have helped shake the bottle of racial unrest that’s been continuously shaken for decades. For the sake of brevity, let’s take a look at just three who’ve most recently had their hands on the bottle. I’m sorry, Mr. President; is that why we should be peaceful? Not because violence is wrong, counterproductive and ultimately self-destructive, but because it’s what the Browns want? Well, thank God they’re not crying for blood, then. Obama’s calls for peace come across as weak, in large part, because of his own contributions to racial tensions and division in America. Typical of most liberals, he’s constantly playing the race card, from claiming that conservatives oppose him because of the color of his skin (as opposed to the deficiency in the content of his character) to taking stands in racially charged cases with no regards to the facts (ie. Henry Lewis Gates and Trayvon Martin) to opening the floodgates to illegal immigrants at our southern border while ignoring the hardships of Americans and the huge number of legal immigrants who have found themselves trapped in a quagmire of red tape that stalls their efforts to gain citizenship the proper way. Add to that, just for fun, his close ties with other race baiters like Derrick Bell, Jeremiah Wright, Dorothy Tillman, and Al Sharpton (We’ll get to him in a minute). Obama’s entire career has been built upon the liberal Democrat practice of using race as a bludgeon to clear the path of any opposition and of building narratives of class and racial division in order to keep the people who fall for those tactics looking to them for some sort of salvation from this supposed cesspool of racial injustice and hatred we call America. Next up is Eric Holder, the U.S. Attorney General who, no matter what his color, should’ve been fired, if not brought up on criminal charges, a long time ago. He’s engaged in the practice of racial division with the fervency of a true believer. He’s propagated the narrative that blacks are victims at the hands of evil racist conservatives and corporations…and probably anyone wanting to launch an investigation into his actions as Attorney General. He opposes voter ID law as racist and disenfranchising because, apparently in his mind, only whites are smart enough and rich enough to get cheap and, in many cases, free state-issued IDs. He feels perfectly comfortable inserting the federal government into local criminal investigations like the Trayvon Martin case and now the Michael Brown case, only succeeding in furthering the idea of America being a racist place where minorities have no power, except what is given to them by the government. At the same time, he has refused to do his actual job when it comes to things like investigating the New Black Panther Party for blatant acts of voter intimidation; a crime that is actually in the jurisdiction of the Attorney General. He has worked so hard to drive a wedge and set back race relations in America as much as he possibly can. In contrast to his actions over the last several years, now he’s calling for peace in Ferguson…a request that is obviously falling on mainly deaf ears. Eric Holder has become the equivalent of a man who pulls the pin on a grenade and then begs it not to explode…and he’s proving to be just about as successful. Then there’s the man who Barack Obama has called “a voice for the voiceless and … dispossessed,” Al Sharpton. Sharpton’s entire career has been immersed in hatred, bigotry, division and even bloodshed. From the Tawana Brawley case, where Sharpton didn’t even believe that Brawley had been raped but went ahead anyway, accusing an innocent man who ended up committing suicide, to his campaign against Jewish storeowner Fred Harari that led to seven murders by one of Sharpton’s followers, right up to the Michael Brown shooting, the aftermath of which will turn out poorly as well, if Sharpton has anything to do about it anyway. Remember how these other agents for left-wing race baiting and division at least make it look like they’re genuinely calling for peace? Sharpton can’t even be bothered with anything more than the most cursory of that kind of posing. He was waiting for the grand jury decision like a kid on Christmas, with major protest demonstrations organized and ready to start in 28 cities across America. After the decision was released, he went on to call for a continued federal investigation into a case that has now been properly and legally laid to rest in the courts. Apparently, for Reverend Al, the courts only have validity if they do what he wants them to. Otherwise, he’ll just try to kick it up to other levels of government and openly abuse our legal system for his own personal gain. Sharpton called the verdict, “an absolute blow to those of us that wanted to see a fair and open trial.” Of course, how can you have a fair and open trial that starts with the abuse of the legal system to get the trial that you want, but is not supported by the established process of law? It reminds me of a western I saw once (the name escapes me) where a lawman told another man, “Don’t worry. You’ll get a fair trial, followed by a first class hangin’.” Other than the fact that Sharpton doesn’t have a Texas drawl, those are the kinds of words I imagine could come flowing quite comfortably from his lips. Sharpton has also announced that he will continue to “rally around the country” regarding the verdict. Obviously, he believes he can still milk more money and media attention from this death and the misery and devastation of this town, which is partly due to Sharpton stirring up unrest. The bottom line here is, when these people who have built and protected their careers by promoting narratives that encourage people to feel like victims, to feel powerless and set upon by enemies who they have no chance to fight against, to feel cornered and pinned down with nowhere to go, no way to improve their lives by their own actions; do not believe them when they start acting surprised or shocked when all of this pressure they’ve been applying blows up. Don’t believe that they’re sincere when they call for peace; for calm and rational behavior. It’s the fear and the frustration that that they can manipulate into dependency that keeps their bank accounts full and their positions secure. At the same time, the next time you say or think something about how you can’t believe people would destroy their homes and neighborhoods, stop and think about those who’ve been pressurizing these communities, as well as the communities and individuals who have bought into this horrible narrative about their own un-acceptionalism. Remember that this is what those who cash in on convincing others that America is an evil place filled with racists and self-serving, victimizing fat cats want. Realize that there really is nothing shocking when communities explode like this. The only really surprising thing is that we aren’t seeing this kind of ugliness more often, considering the decades of seeds that have been planted, especially in the soil of minority communities by self-serving liberals who are more focussed on their own selfish ends than the means. And, much like opening a bottle of shaken up soda, riots in places like Ferguson, Missouri are very easy to see and understand, both in terms of the causes and the inevitable effect. Unlike the bottle of soda, the clean-up is a lot more difficult and heartbreaking.